Registered patients and non-registered patients please call the Polwarth Dental Clinic on 0131 229 8143 as soon as possible during practice opening hours and we will endeavour to see you on the same day. If you have a broken tooth you should see your dentist as soon as possible to determine the extent of the damage and to avoid further complications. A cracked or broken tooth opens up the door for decay and can often cause pain when you eat or drink. Minor damage doesn't always affect a tooth's ability to function normally, however a broken tooth can have a big impact on your appearance. For this reason, many people choose to repair the tooth to improve their smile. At Polwarth Dental Clinic we offer a wide range of restorative dental treatments to fix your broken tooth. There are often a number of different ways to solve the problem of a chipped or broken tooth e.g. We use modern nanotechnology materials that offer superior aesthetics as well as being long lasting and hard wearing. Inlays and onlays are used when your tooth needs more support than a regular filling and are often used for larger cavities at the back of the mouth. 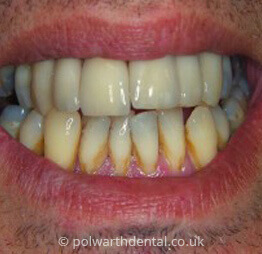 A Veneer is a cosmetic facing which can be placed over a broken tooth to restore its appearance. Crowns offer great protection for the tooth and once restored can last for many years. Your dentist will examine the tooth and discuss all the options available. Occasionally if a tooth is heavily decayed and non-restorable we may recommend a bridge or dental implants. The importance of an attractive smile should not be underestimated, as your smile is one of the first things people notice about you. 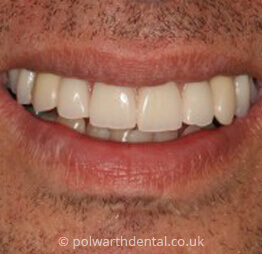 Here at Polwarth Dental Clinic, all our team are highly trained in improving the appearance of your smile. Although maintaining the health of your teeth and gums is our priority when fixing your broken tooth, we are equally passionate about making you feel confident with your smile. An attractive smile is one of the most memorable features of your appearance. We aim to provide you with all the treatment you require to give you your ideal smile.